This Is Who We Are……. Thank you for being our customer! Truly- sincerely- I mean that! In this global world – where the internet provides endless choices- the fact that you are here at The Purple Painted Lady is huge! I promote that we offer the best customer service in this industry. In fact- just read the post HERE to understand how I feel about customer service and my expectations on how we serve you. 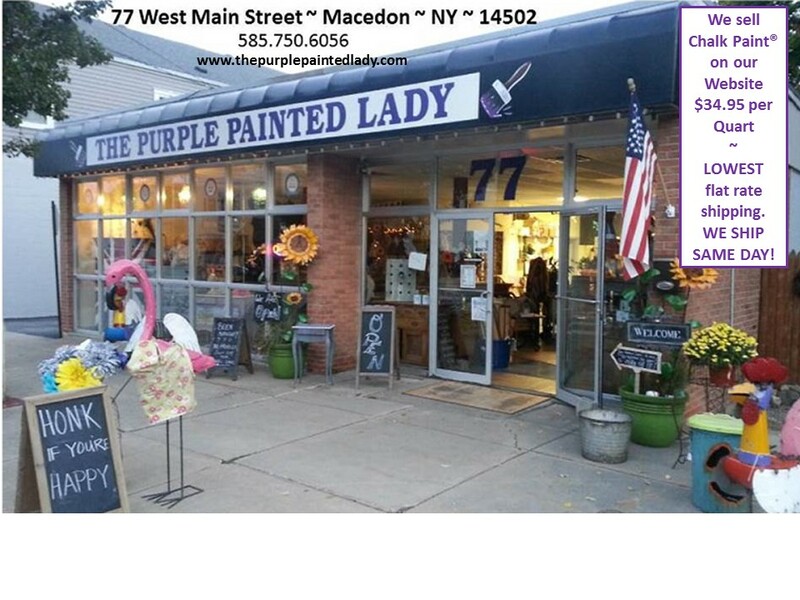 I believe strongly in customer service, but The Purple Painted Lady would not be what it is with out all the lovely ladies who help at our shops in Macedon (main store), Greece and Baldwinsville. I would like to introduce you to Courtney and Britni. Courtney is the high school graduate on the left, who can draw anything! She is going to college and is passionate about sign language and will be an amazing interpretor. Courtney always has a smile on her face and has been impressive in how quickly she learns our business processes. 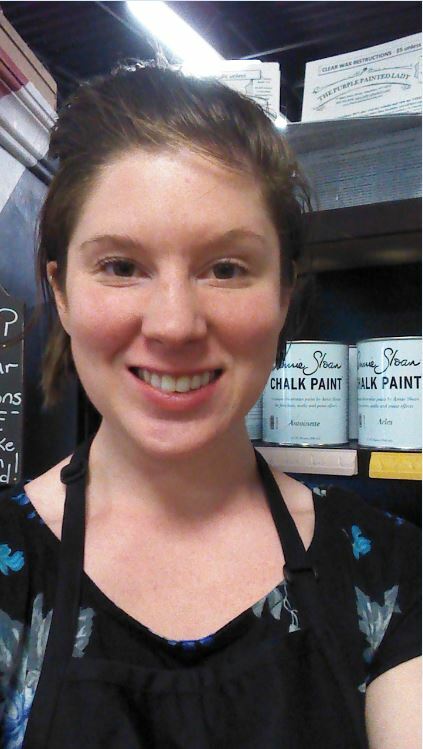 She is typically the one doing custom painting projects and is our shop “tinker” – in that she can fix just about anything. And on the off chance she cannot- her dad can! 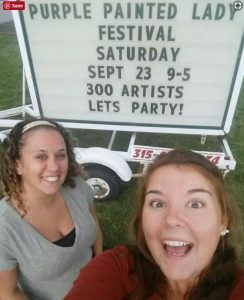 Her mom, dad and brother are extremely cool people and if you have ever attended our annual September art festival- you will see the whole family there. I am very – very fortunate to have her and would adopt her – if her mom and dad would allow me too! Then….. I would also like to introduce you to Britni, who is on the right of the photo above. Typically, if you see one of them…the other is not too far behind! Britni s a full-time college student by day but the person who is typically managing The Purple Painted Lady’s email coorespondance by night! She knows her stuff since she is one of my longest employed employees. 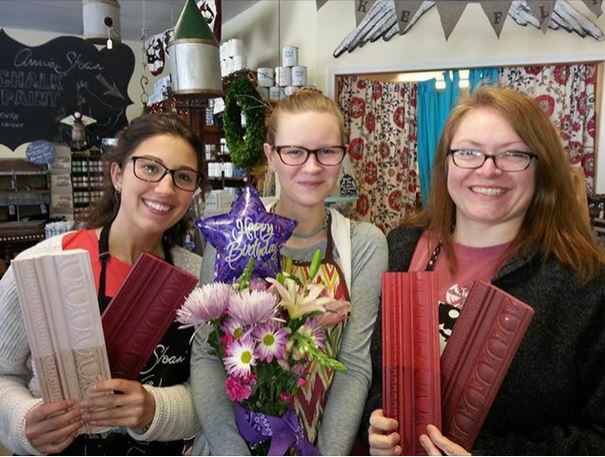 Because of Britni, I met Courtney and a few other key players who are part of our team and I am so grateful, that timid young high schooler who boldly walked into my shop….stayed with me and has grown to an amazingly strong woman! Just a side note, that when Britni graduated, she did so at the top of her class! She rocked her grades and is extremely passionate about the arts. 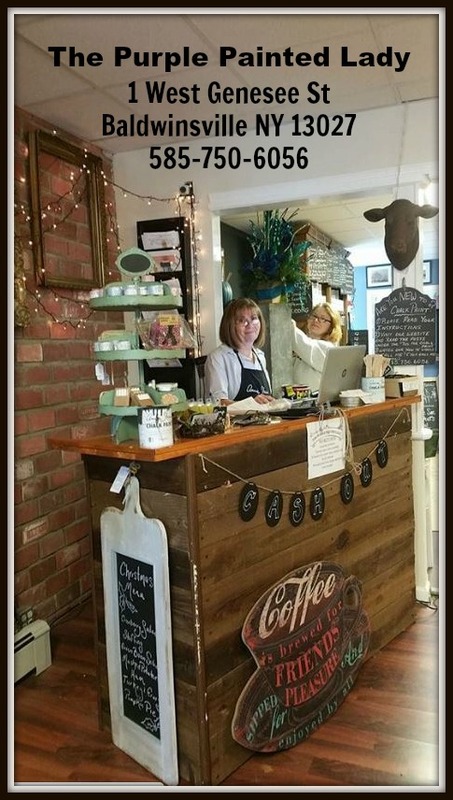 If you stop at the Macedon location….. you might run into her or have her as a workshop instructor since she is now certified through the Annie Sloan organization! Anne ..who is featured in the photo below basically manages all of the details in our Greece location and is significan in the cool workshops at our Village Gate location for us. 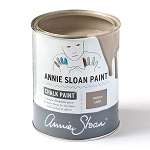 Anne became addicted to Chalk Paint® by Annie Sloan when she found 2 heavy wooden nightstands on the side of her road while walking her dog Stoli and carried them all the way home one at a time through a snowstorm. (no joke!) She loves to save old furniture from thrift stores, garage sales, and the curb. As long as she does something creative every day, she is happy. Visit her in Greece or Village Gate on Saturdays and watch as she transforms some curb side item that was crying our for help into some marvelous piece that she resurrected. 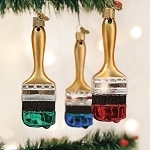 painting, and just creating beautiful things! She will do custom work and always can be found at the Bville location. She joined our team in early 2015 and has grown so much with us! We appreciate you Karen! Anyway, I bought about 10 tickets and brought my husband Steve, Daughter Danni and a truckload of her girlfriends to the eprformance and we were all impressed! 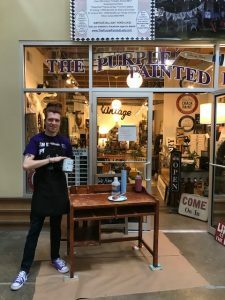 It was that night I walked up to Luke and said, “you should really be working at The Purple Painted Lady!” Well, the rest is history! So, the photo below shows Luke getting ready to demo at our Village Gate shop. Thanks Luke for not thinking I am crazy as I solicited you to work at the shop!!! 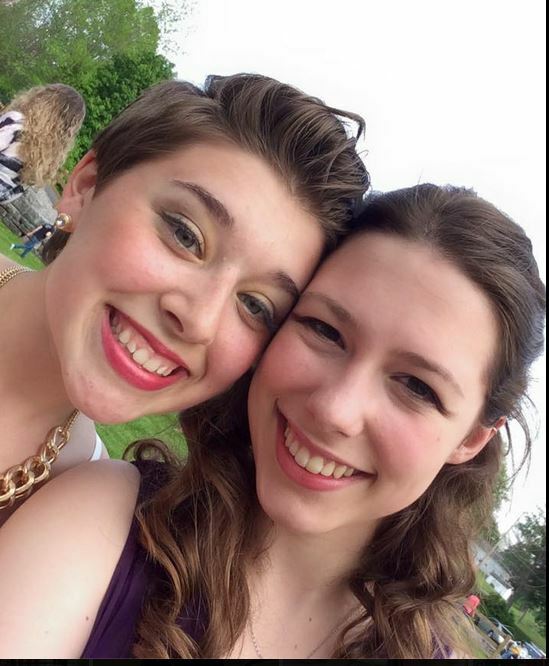 Next we have Sara who is below on the left …..Sara is amazingly enthusiastic and has a tremendous amount of energy! She is typically at our main store in Macedon, but can also be found at our Village gate loacation. Sara helps me have sanity! She is in tune with all of our merchandise and floor inventory- so if you are looking for something inparticular- she will know which store it is and where it is located. She’s spunky and has been a life saver to me!